I was sold on this brew from its ad campaign. An all-American lager inspired by camping days of yore? Sign me up. Also sign me up for the kickass color scheme on the can. Blues and whites coming together in a nostalgic '50s throwback? Yes, please. At first I wasn't sure if this lager'd see any distribution. When it was launched at an urban campout in Dayton (Warped Wing's stomping grounds), the brewery itself had no idea if they get the brew out of the Gem City. Luckily for me, they did. While Warped Wing's website doesn't have much info on the brewery (that I could find), they have a fairly robust "About" section on its Facebook. According to that, Warped Wing is inspired by Dayton's rooted history in invention and innovation (namely, I presume, the city's contributions to aviation--hence the brewery's name). The company aims to craft original brews and new twists on old favorites. 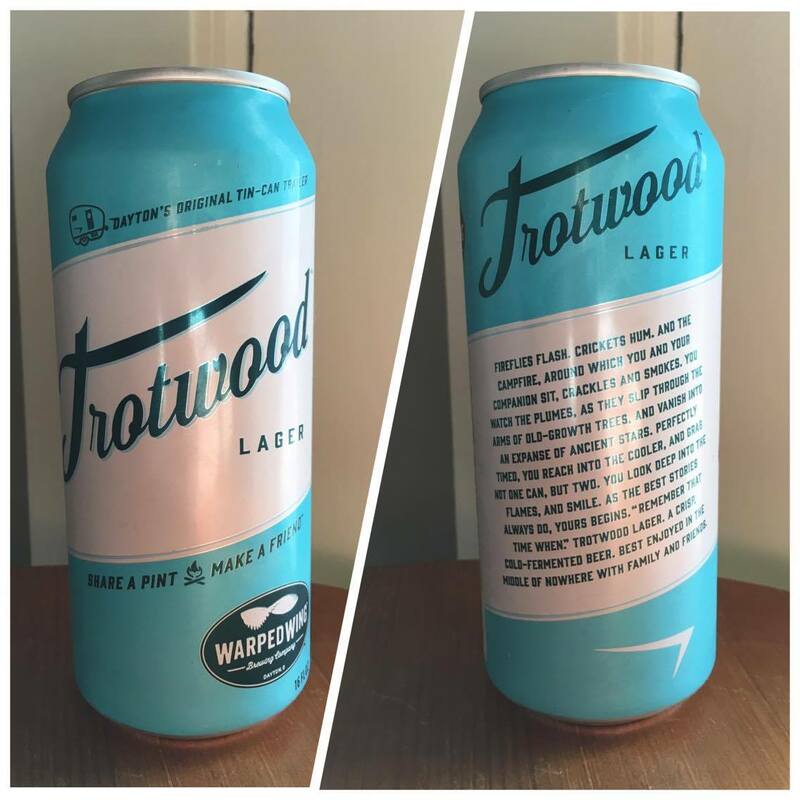 Speaking of old favorites, that's exactly the style the brewery took on for Trotwood--a lager. This video says it's light and crisp, styled after a traditional lager only more flavorful. My can says the beer has an ABV of 4.0%. Other than that, the beverage in the can is pretty much a blank slate to be explored. Right off the bat, the aroma hits exactly what the brewery aimed for: Trotwood smells light and crisp. It has that toasty, rice-iness that you'd expect from a lager. Imagine the aroma of a Bud, only good. It's almost what Bud was probably originally meant to before AB InBev ensured its complete distortion. Only much better than that. 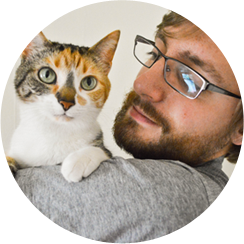 Purrl, for her part, gave it four whiffs. So, she thinks it's okay. I guess. The lager tastes like a lager. Not overly hoppy, like what you may expect a modern take on the traditional lager to be. In fact, it stays true to that traditional style. There's a bit more caramel in here than other lagers I've had. But, in the end, it really doesn't reinvent the style. Warped Wing merely presents the natural evolution of what it should be. This beer feels crisp and refreshing. Call it a lawnmower beer. That's what it is. It goes down smooth and easy, with just enough carbonation to build up in your gut and explode into a hearty belch. Just what a lager is supposed to do. I'm pretty sure I've mentioned this in a previous post but in case I haven't, or in case you forgot, I worked at the Athens, OH Kroger before going into my first year of grad school. I was a deli clerk and on the lowest rung of ladder. More often than not, I was stuck on the closing shift--10 pm. But, there were times I would get done at eight. Instead of driving to work, I always walked. Rain or shine. Those nights when I finished at eight were the best. I'd hoof it home on the bike path, which runs along the Hocking River. The sun would set sometime along the way, fireflies would come out, there'd be a cool breeze blowing of the river, and the lights lining the side of the path would be reflected in the water. It was a quintessential summer experience. And, damn if I'm not thinking about it while drinking from this can at my side. Trotwood is a great lager. Due to the intricacy Warped Wing has shown in staying true to the style while making slight improvements, the brew has shot to the top of my lager list. It's gets a well-deserved 9.0/10 from me. I hope it comes back this time next year. I like the can design! They really did a killer job with it, huh?